You don't see a lot of recipes that use Calvados—too few in fact. French apple brandy aged in oak is a fine product worthy of your admiration and attention, and it always surprises us with how nicely it plays with other ingredients. When we are in an experimental mood, we often forget we have a bottle of Calvados in the cabinet. It's probably time to change that. 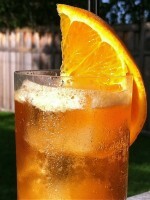 In addition to the base spirit, the Honeymoon employs both DOM Benedictine and orange curaçao as sweeteners. It's hard to go wrong with Benedictine. We love the herbal complexity it adds to any drink and this one is no exception. For a liqueur, it often arrives surprisingly less sweet than a recipe's quantity might suggest. When we first considered the proportions listed here, we expected the volume of just one of these liqueurs to do the job, not two. This leads us to the curaçao, an orange flavored liqueur. Neutral spirits sweetened and infused with bitter orange peels is typical of its more popular cousin, triple sec, but quality curaçao is supposed to have a brandy base (think Grand Marnier) or at least a brandy element to its construction. Using brandy to make orange liqueur adds a depth of rustic interest that takes it beyond a regular triple sec. With Grand Marnier as one example, another trend in this area is the resurrection of dry curaçao which places more emphasis on historical brandy-based design and less sugar. Depending on your inventory, you may feel the draw to adjust the proportions or even consider using Applejack if you are all out of Calvados. However, we strongly suggest trying this drink as-is before making any changes. Even at a full ounce of liqueurs versus half that amount of lemon juice, the drink is perfectly balanced. It may be Benedictine's knack for being less sweet than expected or it's ability to deliver subtle nuances of bitter herbs—either way, this drink is not overly sweet. It strikes us as just the right combination of sweet, sour, strong and herbal—perfect for any occasion.